I have been competing in the Golden Demon competition since 1998 and on numerous occasions been asked questions about my entries and how to prepare for the event. In this article I try to answer the many questions and explain some of the myths about the Golden Demon competition. The aim of the essay is also to encourage you future GD-winners to work hard because one day it could be you on that stage raising the sword into the air. So, what is Golden Demon if we are to sum things up even before I begin? I define Golden Demon as the biggest miniature-painting competition within the field of the Games Workshop hobby. The first part of the definition is rather clear, but I feel the need to add that it is both a painting and sculpting competition although most people focus on the painting part. The second half of the definition is phrased within the Games Workshop hobby and this means that in relation both visual appearance and fictive background the entries must be part of the Games Workshop's universe and hobby. To me the most important thing when starting on a GD-project is that I am very excited about the idea and that I have the right gut-feeling for the project. Over the years I have started several projects but in the end some where finished and some where not. Another thing for me is the experience that some projects need to mature over time. 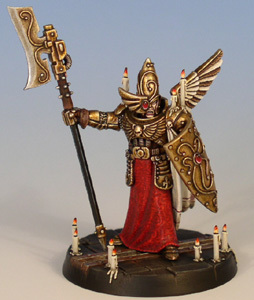 For instance my Adeptus Custode Guard was thought up in July 2003, created in Summer 2004 (and taken to the GD where it failed to place), and finally properly finished in 2005 (with candles added, a bigger base, and a touch-up on the paintjob). As you can see from the images below the model went though several stages before it looked complete. In the case of the Custode I believe that in particular the candles and the base (with many candles!) were the things that gave the model that extra unifying touch that binds a good GD entry together. In other cases what needs to mature is maybe ones modelling skills, painting skills, or maybe you just need more time. But spending some time considering whether you are actually able to produce the idea you have come up with is an important thing if you want to compete in the big competition. No reason to break your back on a project that is way too complicated. Therefore, when it comes to choosing your entry think good about what the possiblilties the categories offer and read the official rules carefully. The single miniature caegories are always fiercely competitive since you only have one model to show all your skills. On the other hand categories like squad and regiment gives you plenty of models to show off on and therefore also more practice - these categories are in my opinion a good place for those who are new to GD. Monsters and vehicles are sort of inbetween - more work (in regards to the bigger areas to finish) but also more room to show off on. Diorama and duel categories offer the option to tell a story - this is also possible in the other categories but here it is the main focus. Do remember that no matter what kind of entry you choose to do GD is primarily about painting and modelling GW images according to my definition above. So - for instance - good story-telling in a duel still need to be expertly painted. As mentioned ealier I consider GD a kind of design or imagery competition and by this I mean that there are certain things your entry need to have to qualify. Needless to say you need to show good painting skills - smooth colour transition, an interesting and well-balanced colour scheme, as well as technical details are things that you usually find on most GD-winning models. Not that you need to plaster a model in freehand-painted designs - in my opinion a cool banner or a nicely done border on a cloak can be enough. Regarding modelling skills this is a secondary - but no way insignificant - aspect of the competition. 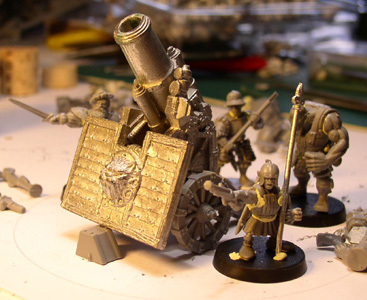 For those who are new to sculpting simple conversion and adding small extra details is a good place to start, but you also see scratch-built models at GD. Just remember that when you start modelling even when you get additional points for sculpting you are also in theory competing against guys like Jes Goodwin, Brian Nelson or other GW-sculptors. My approach is usually to create complex conversions mixing parts from GW figures and doing conversions naturally leaves room for some sculpting when the bits are being worked together. So, how is it done in practice? Well, I usually come up with many ideas and always try to get them sketched down. 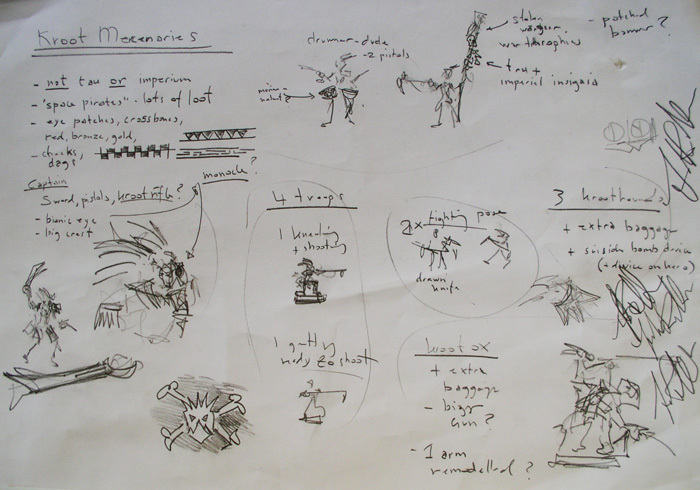 I use a mix of quick drawings and written comments like the example below which is a detail from a preparatory sketch done for my Kroot Mercenaries. The complete Kroot sketch is avaliable here. Another way of getting started is to get out some of you favourite miniatures and bits that you like. As you probably have noticed I have a personal liking for the old Eldar Scatter Laser and various old plastic shields from Marauder Miniatures. Get out the bits and miniatures and let your mind start coming up with ideas. It is usually good to have cutter, hobby knife, and some blue-tack ready to assemble the conversions and try out ideas before starting with superglue and greenstuff. Just like sticking together a conversion using blue-tack creating a so-called mock-up can be useful if you are planning a very complex entry. The mock-up is a model you can use for trying out the pose and checking - for instance - whether an idea will work from several angles. Here is the mock-up and the final version of a Chaos Duel I created a few years back. Or - if you are doing a diorama - a mock-up can simply be some models arranged to represent the final models in the diorama and you can use to mock-up to visualize the composition making it a lot easier when are starting to work both on the base and the actual models. One of the hardest things to do is too discard a thing you love - for instance a very nicely painted freehand design or maybe that little sculpted creature that was planned to finish the base. In the process of creating competition miniatures I usually meet these decisions where I have worked hard just to find out that the thing I created does not work with the whole composition. It is tempting to work on and see how it goes but usually a certain design rule should be carried out. And the rule in question is called "kill your darlings". You need to cut away those things that does not work despite of how great these things are and regardless of how much time and energy you have spend creating or thinking out these clever details. Doing the actual painting is plain hard work. However, there are lots of tricks and techniques for blending, glazing, etcetera available. Some can be found on the web (check my own Tutorials and the many websites in my Links section), Games Workshop has produced some painting guides a while back, and Rune Kappel created a CD about miniature painting where I contributed with a few tutorials myself. Also remember to seek advice from other painters - the website CoolMiniOrNot is a good place to show work-in-progress pictures of your mini and especially in the forum section you can get lots of feedback. But do remember that if you ask for feedback you will have to accept your pieces being critiqued - sometimes even torn to pieces in writing. However, do not let this take you down... Critique is help and you will learn a lot. Also remember to discuss you mini with local people - the web is good, but some things do show better in real life. Before throwing yourself out into painting the model you just spent two months worth of evenings converting and modelling why not paint a test model to get the colour scheme right? 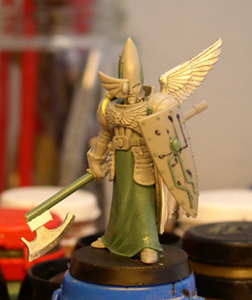 Practice is one of the main virtues of miniature painting. People often debate whether a display base is a must or not. I think is more a case of whether the entry can benefit from it or not� plus a display base usually makes transportation and handling of the model easier. I have won several Gold Demons for models presented on the standard gaming base, but I have also won with models on nice plinths and presentation bases. 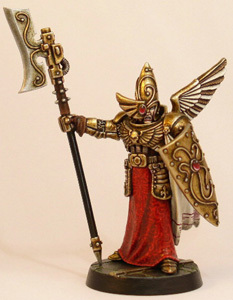 If you decide to go for a presentation base I will suggest that you get one that in regards to both form and colour presents the model without drawing too much attention to it self. After all, it is about presenting the miniature � not the base it self no matter how nice it is. 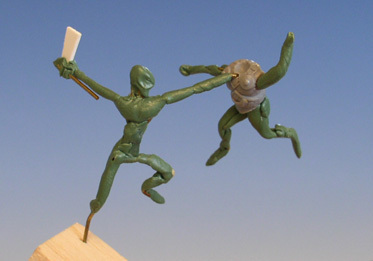 If you are entering a group of models I think a display base is a great way of finishing and uniting the models. It is sort of the next level from the ordinary stuff like a coherent colour scheme and themed bases, where the presentation base adds the last touch by the arranging the minis in a carefully planned composision that adds to the background story of the models. Check my tutorial on making presentation bases using GW paint pot lids. One of the worst things about GD is the waiting. The journey to the event. The waiting time to get in. The judging. I always get relieved when I have handed in my entry, because from that moment everything is out of my hands. From now what happens is up to the judges. I have never judged at GD myself but I am guessing that it is a very hard job. I usually plan to meet up with several people during the day to keep myself busy while the judging takes place. I also usually carry a bunch of extra figures with me to have something to show and discuss with other painters... after all, the hobby is also about sharing or teaching techniques and learning new ones. There is no conclusions to this essay - only encouragement. 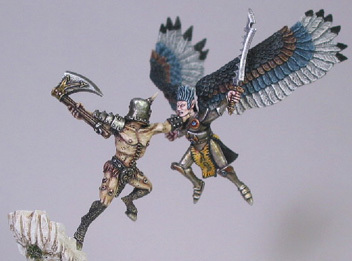 Remember that miniature-painting should be both fun and challenging. Challenge yourself from project to project, seek advice from other painters, and remember that it takes time and patience to create a good GD entry.